Full Description: An original promotional postcard of an elegant lady playing a metal-ended hexagonal Maccann duet concertina. 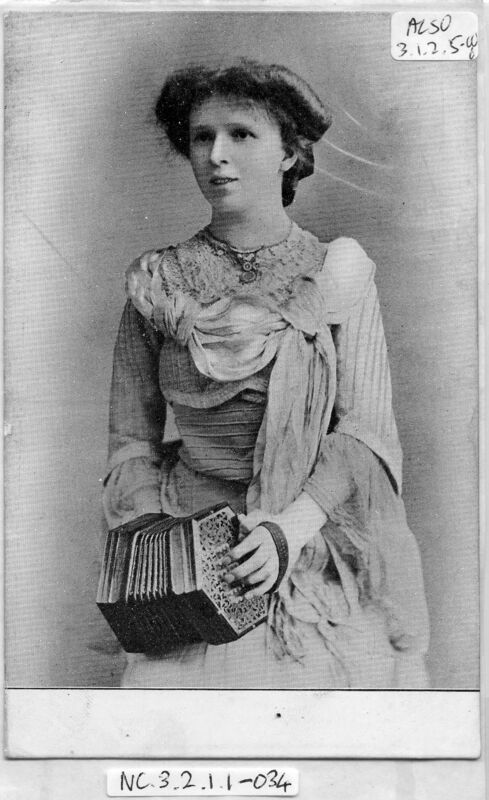 The divided rear of the card bears the legend: "Miss Flora Sutherland (Gold medallist) English Concertina Soloist, at liberty to accept engagements at Concerts, &c., playing Classical and Popular selections". 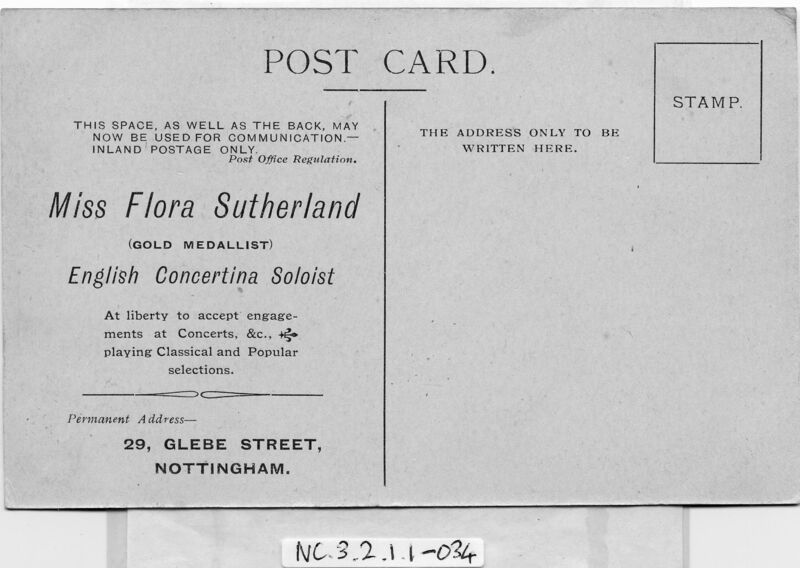 "Permanent address - 29 Glebe Street, Nottingham.� The Collection has another fine photograph of Flora as Item NC.3.1.2.5-006 . Flora was the sister of Alexander Prince (birth-name Sutherland), and may have lived with her brother at the Glebe Street address, where Alexander based his music publishing activities. Neil Wayne visited Prince's much younger brother at the Glebe Street premises in the late 1960s, and viewed many old photos of Prince. Prince self-published his concertina arrangements to sell to his pupils and others from Glebe Street, with some surviving copies even being over-stamped as being sold via Wheatstone's West Street premises. For examples of Prince's publications, see items NC.5.2.2-002 , NC.5.2.2-003 , NC.5.2.2-004 � and NC.5.2.2-005 .